This was an alternative to the Nascom RAM A and B cards. It was the first to allow more than 64k to be installed on a single NAS-BUS/80-BUS computer. Gemini had already produced a 64k RAM card and the GM813 64k processor card. The latter mapped ROM into the RAM area by outputting selection values to port FE. Capacity was 256kB. It was available as a PCB (42.5UKP in 1983), to which you had to add all the components yourself! Total cost including RAM came to just over 200UKP so it was quite an expensive device. It was also available ready built with sockets for the RAM in 64k and 256k versions. The 64k version was upgradable to 128k, 192k or 256k. 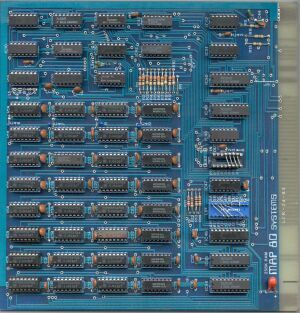 The address mapping allowed this card to work with the Nascom-1, Nascom-2 and Gemini GM811 using 32k memory blocks. It would also work with the GM813 (using a small hardware change) by adding extra 4k blocks! One of the things that made this card famous was the standard of the documentation. It was dire. Written in a complex style with no circuit diagram and no examples of how to program using it. There is a slight problem when using this card with the Gemini GM813 processor card. That card does not put address line A19 onto the bus (this is quite correct and is in line with the NAS-BUS specification). This limits the maximum available memory space on the bus to 512k. When more than this is required an additional bus signal has to be added to get it!